Newsline, with about 100 field updates on Haiti. Neither the annual reports nor other sources give a comprehensive account of UNICEF's activities (except at the broadest level) or a sense for how UNICEF's funding breaks down by program/region. UNICEF. About UNICEF. http://www.unicef.org/about/index.html (accessed January 10 2011). Archived by WebCite® at http://www.webcitation.org/5vdloM2GZ. UNICEF. About UNICEF: The structure of UNICEF (PDF). http://www.unicef.org/about/structure/index.html (accessed December 14, 2010). Archived by WebCite® at http://www.webcitation.org/5uztUCdoe. UNICEF. 2009 Annual Report (PDF). UNICEF. Creating a Haiti fit for children, three months after the earthquake (PDF). http://www.unicef.org/infobycountry/haiti_53288.html (accessed December 14, 2010). Archived by WebCite® at http://www.webcitation.org/5uztFcTAJ. UNICEF. A Haitian mother struggles to provide her family with safe water (PDF). http://www.unicef.org/infobycountry/haiti_56775.html (accessed December 14, 2010). Archived by WebCite® at http://www.webcitation.org/5uztDXjmq. UNICEF. Home page. http://www.unicef.org/ (accessed January 10 2011). Archived by WebCite® at http://www.webcitation.org/5vdl5Raxw. UNICEF. Newsline (PDF). http://www.unicef.org/infobycountry/haiti_newsline.html (accessed December 14, 2010). Archived by WebCite® at http://www.webcitation.org/5vdlaXH6v. UNICEF. 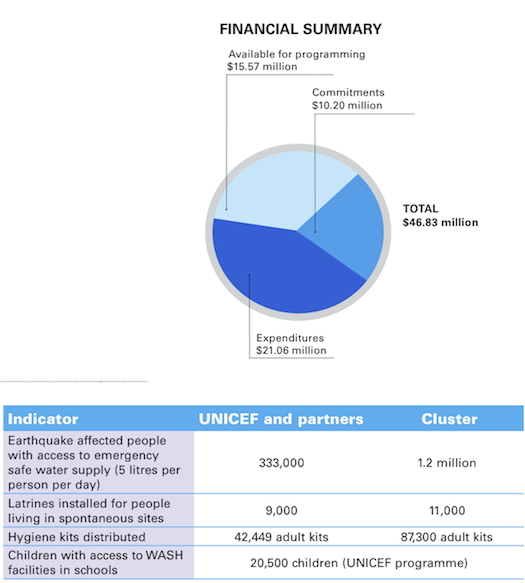 UNICEF in emergencies (PDF). http://www.unicef.org/emerg/index.html (accessed January 10 2011). Archived by WebCite® at http://www.webcitation.org/5vdlAnVGL. UNICEF. What We Do (PDF). http://www.unicef.org/whatwedo/index.html. (accessed December 14, 2010). Archived by WebCite® at http://www.webcitation.org/5uztXzNB1. interim basis as of 25 June 2010." UNICEF, “Haiti: 6-Month Report,” Pg 28. Total expenditures in millions US&dollar;: "70.49 ... Amounts reported on are on an interim basis as of 25 June 2010." UNICEF, “Haiti: 6-Month Report,” Pg 29. UNICEF, “Haiti 6-Month Report,” Pg 29. "Today, some 333,000 people are being provided with at least five litres of safe water a day through UNICEF and partners' water supply operation, which represents 25 per cent of the overall delivery effort reaching 1.2 million people." UNICEF, “6-Month Report,” Pg 7. “UNICEF and implementing partners have also accelerated latrine construction, installing over 9,000 latrines to date out of the total 11,000 installed by the WASH Cluster... At the same time UNICEF has supported training on promotion of key hygiene practices, such as hand washing with soap, for some 2,200 hygiene promoters and community mobilisers.. Some 213,240 persons have also benefited from UNICEF's distribution of personal hygiene kits—which provide for the basics including soap, sanitary towels, toothpaste and toothbrushes, detergent, and toilet paper, among others... Some 20,500 children are currently benefiting from UNICEF's support in 18 schools, and plans are underway to reach 30 schools by August, and a total 600 others by the end of the year, with a simultaneous focus on child-friendly spaces.” UNICEF, “6-Month Report,” Pg 7-8. "Cluster partners have more than doubled the number of children registered—from 767 in April to 2,047, of which 337 have been reunited with their families, while others have been supported to find appropriate family-based care options, following a careful assessment... More than 62,800 children and youth, of which 37 per cent are girls, are benefiting from 225 child-friendly spaces supported by UNICEF in and outside of Port-au-Prince." UNICEF, “6-Month Report,” Pgs 10-11. “Some 2,300 teachers and 3,000 education personnel have been trained so far and 30,000 more are planned over the rest of the year. Critical in the effort to re-open schools has been UNICEF's distribution of some 1,297 school tents for 225 temporary learning spaces...To encourage enrolment and attendance, some 185,616 school-aged children have been provided with basic educational materials (out of 500,000 learners supported by the Education Cluster)—while 45,520 pre-schoolers received learning and recreational materials through the distribution of Early Childhood Development kits.” UNICEF, “6-Month Report, “ Pg 15. “At the six month mark, more than 550,000 children under five and pregnant and lactating women have benefited from ready-to-eat supplementary foods while over 186,000 children aged 9 months to 7 years also received vitamin A supplementation through ongoing immunisation campaigns.... Some 23,000 mothers and babies are also being helped through a network of 107 “baby-friendly tents” that provide counseling on proper infant and young child feeding (IYCF), such as exclusive maternal breastfeeding in the first six months... Sprawling camps with shifting populations made for a complex operation but efforts have now accelerated and over 228,000 children in 727 camps have been immunised and have also received vitamin A supplementation and de-worming. In May the Vaccination Week for the Americas reached a further 47,600 children under five in the border areas and another campaign is being launched in July to increase coverage nationwide. Health needs for some 1,770,000 people are also being covered through the distribution of 177 emergency kits that contain essential drugs to combat major killers of children such as diarrhoea and pneumonia. One single kit can also help treat malaria in 1,000 children, and UNICEF has started efforts for the distribution of 400,000 long-lasting insecticide treated mosquito nets (LLINs) to 200,000 households for malaria prevention. UNICEF, “6-Month Report,” Pgs 18, 21. UNICEF, "Young child survival and development." UNICEF, "Water, sanitation and hygiene." UNICEF, "Water, sanitation and hygiene - UNICEF in Action." UNICEF, "Water, sanitation and hygiene - Hygiene Promotion."